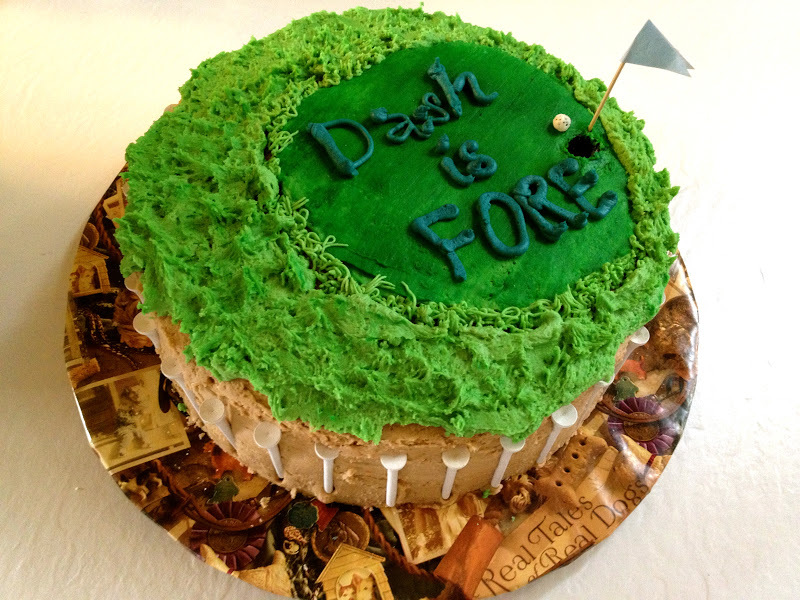 The Dainty Domestress: A Golf Themed Birthday Pawty! A Golf Themed Birthday Pawty! Although, is does not appear as a dog birthday pawty it is...the cake is for the humans and the pupcakes in the top right of the photo are for the dogs. I just love when I can have an event that humans and their furr-babies can enjoy together. Please remember pets deserve human grade ingredients, but not human food! There are many human foods and ingredients that are toxic to dogs. If you are unsure please see the ASPCA's toxic pet food list. Primarily I wanted to share the human cake idea. I stress bake for relaxation and fortunately it led to a pretty cute, themed cake. 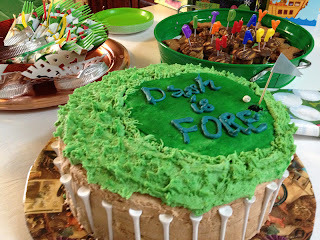 Since a forth birthday only comes around once it was my chance for a Fore! theme. I made two plain white 10" round cakes and stacked them together with a layer of creme cheese, buttercream icing and condensed raspberry jam mixed together. The buttercream icing was tinted light and dark green, tan, and blue with food coloring. I thoroughly washed a bag of my husbands golf tees and lightly pressed them in the sand colored icing all the way around the cake. For the green I built up a layer of dark green and smoothed it with an icing spatula. Next, I had some trouble with my icing bag ripping at the pressure caused by the tip I typically use to create grass. So I took the spatula and laid it in the light green icing then gently with a scooping motion lifted up. The golf ball is a small ball of icing and the flag is a tooth pick with a folded piece of paper. Apparently golf holes are not black, so says my husband after the fact. Regardless, I pushed a hole down into the icing and filled it with some edible glitter. Voila! Quite simple really, to turn out so cute! No Posts? Where have I been?